One way is with the construction of a wooden form by an in-house carpenter who carefully adheres to the specifications for the precast panel (or other item) being made. Wooden forms can be built in any size or shape but they do not stand up to the wear and tear of the manufacturing process and require maintenance after 15-20 runs. Wooden forms also require the manpower to build and the expertise of carpenters who are becoming harder and harder to come by. Other times, precast producers use/re-use steel forms purchased from companies who specialize in these products (i.e.Hamilton Form). Steel forms are great because they last a long time and can be used over and over with proper maintenance. The downside of the steel forms is that they are not adaptable, mostly used to produce the same size/style of precast component over and over and they are costly. Enter the innovative, time and money saving technology known as 3-D printing. PCI Gulf South precast producer Gate Precast embraced this “new” technology with the recent Domino Sugar Refinery project in Brooklyn, NY. In an attempt to save time and money for the project owners and create a beautiful structure with many variations to the panels, Gate utilized 3-D printing to create unique forms into which the concrete was poured and panels created. 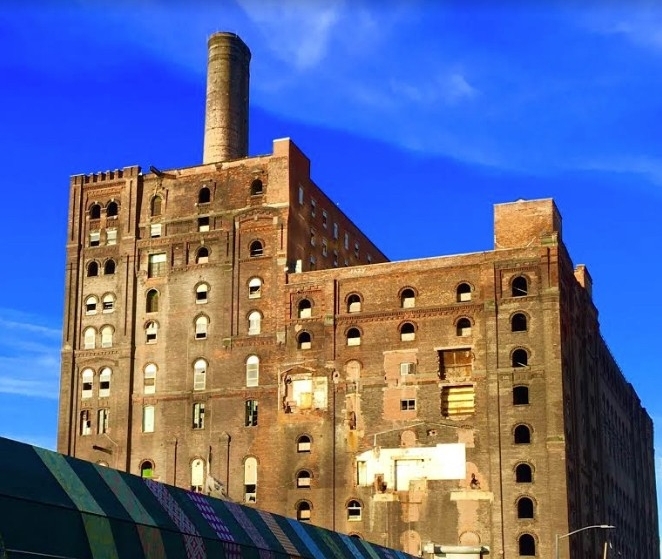 Old site of the Domino Sugar Refinery project in Brooklyn, NY. Photo via the Brooklyn Daily Eagle. 3-D printed windows arriving at the Domino Sugar Refinery project site. Photo via Gate Precast. 3-D printing of precast in action. Photo via AES. Close up of one of Gate’s 3D printed precast windows. Photo via Gate Precast. This innovative technology was first introduced to PCI (Precast/Prestressed Concrete Institute) by Oak Ridge National Laboratories (ORNL) as a potential additional use for the technology that was already being used in other industries such as automotive manufacturing. Gate Precast embraced the opportunity to take this process for a “test drive” with the large scale Domino Sugar project. Creating the multitude of forms by hand (993 panels for the residential portion and an additional 612 panels for the commercial/retail portion) would have taken a great deal of time/money. Purchasing steel forms for this one project would not have been cost effective. Hence, in this particular scenario, 3-D printing of forms served as the perfect solution for the project. Like all technology, 3-D printing has a place in the precast concrete industry. It provides one more “tool in the toolbox” and needs to be embraced for the unique solution it provides. It will most likely never take the place of traditional practices, but it shines a light on what is possible when creative, forward-thinking problem solvers are open and adaptable to new ways of thinking.